What The Hell Did Dwyane Wade Just Sign? The AP reports that Dwyane Wade has agreed to a one-year, $20 million contract. What the hell? Outwardly, both Wade and the Heat are calling the deal a win-win. It gives the Heat some salary cap flexibility for next season, and Wade a pay raise from the $16.1 million he was due to make this season. But on the terms of the negotiations as they played out, it seems like Wade took a clobbering. 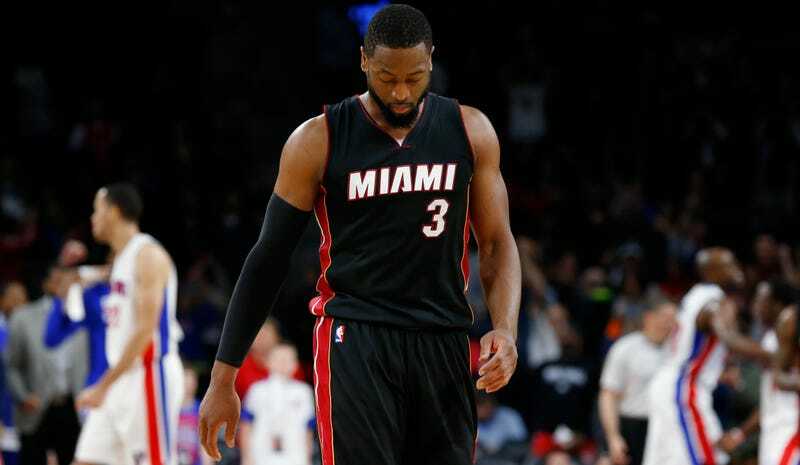 Ramona Shelburne reiterated on SportsCenter that Wade was looking for a long-term deal after opting out, something in the range of $45 million for three years, but the multi-year deals the Heat offered capped out around $10 million per season. From there, the deal makes a little more sense: if Wade makes $20 million this coming season, he has three years (if he has three years left in his knees) to out-earn the other half of a four-year, $40 million contract. Surely Wade can command at least $6.3 million per year; that’s basically a mid-level deal. But an extra year of wear on an already beaten-up shooting guard means even that is a risk. Wade is in a tricky place. He’s still productive when he plays, but because he’s 33 and sat out 20 and 28 games the past two seasons, he really can’t be paid like a top-10 player for much longer. This puts him in exactly the opposite position as the other big-time free agent signing one-year deals, LeBron James. James signed a one-year, $20.6 million deal last year, and he’ll likely sign another for $22 million this year, then sign a long-term one under the new, giant salary cap in 2016. But they aren’t straight one-year deals; they’re actually two-year contracts with an opt-out after the first season. This lets LeBron operate from year-to-year, but puts an extra year of salary in his back pocket in case he suffers catastrophic injury. But if the Cavs could sign James to a five-year deal tomorrow for the very most money they could throw at him, they obviously would. The 1+1 structure is a part of the broader pile of money Cleveland is anxious to throw at him. Wade’s relationship with the Heat is the flipside of that. He’s left money on the table over the course of his career—$25 million since 2010, by one accounting—but the Heat obviously aren’t going out of their way to make good right now. Sure, a 1+1 would be ideal for Wade if he’s looking to take a one-year deal to get to the new cap, but that’s a two-year, $40 million contract if Wade opts in—basically what the Heat were offering for twice as many years. (It would also add the possibility that Wade and the team don’t agree on a longer-term deal next summer and he simply opts in, eating up the 2016 salary cap space the Heat have been hoarding.) Because the real incentive for a “1” for Wade is frontloading, and because the NBA limits decreases in pay the same as increases (7.5 percent of the first year of the deal, meaning the lowest a second-year salary could go would be $18.5 million), a 1+1 doesn’t work. Either it would be way more two-year money than the Heat are trying to allot to a sexagenarian, or the first year of the deal would drop low enough that a short-term deal wouldn’t make sense. So what happened here is Dwyane took a very big risk by going into a one-year deal with no cover fire, and had to precisely because the Heat think he’s too risky over that year to commit to the next.